simple is the theme during summers. as long as my meals hit on those three things during the summer i am one happy girl. 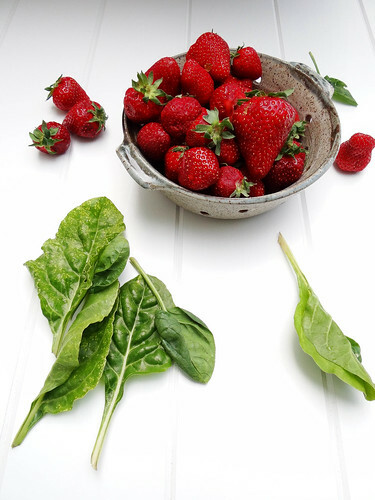 native strawberries are hulled and quartered, asparagus is trimmed and the baby spinach is washed. 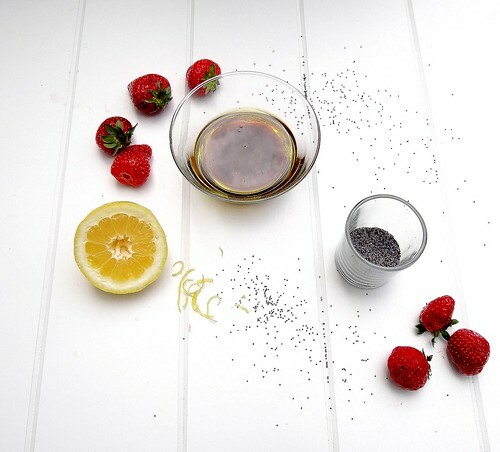 add a little lemon, salt, balsamic and olive oil for a truly satisfying summer salad. summer = heat which equals a sometimes cranky Justin who has to work long days outside- he likes to come home to an ice box house. which i completely understand. so that means being creative on the grille - everyone loves to grille in the summer right? the asparagus. 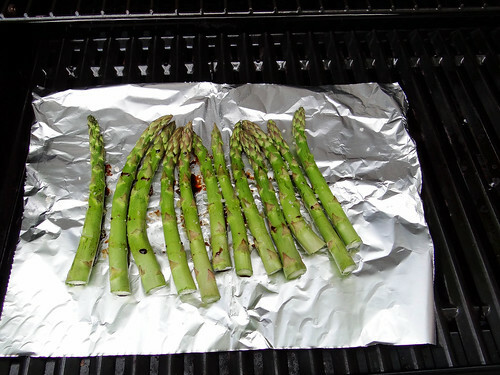 drizzled with balsamic, olive oil & sprinkled with maldon salt is grilled until crisp tender. this past weekend - memorial day weekend was packed full of family events.it was the perfect opportunity to share my love of local goodness with my family. along with the maple chipotle sweet potato burgers, this salad accompanied me to my grams memorial day BBQ on Monday. leftovers came home with me and were enjoyed the following day for dinner. taking Caitlin's cue, i topped my leftover salad with a healthy serving of avocado. OMG - amazing, i was speechless. the avocado was so good and added a nice serving of healthy fats. 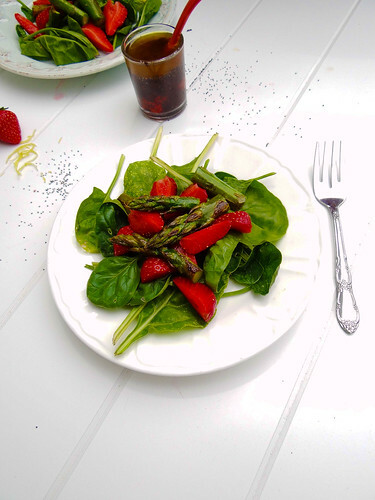 my sister, who also shares a love of fresh locally grown foods gave this two thumbs up.this salad would also be delicious topped with pecans or slivered raw almonds. tell me, whats your favorite summer salad? on a serving platter, arrange spinach. 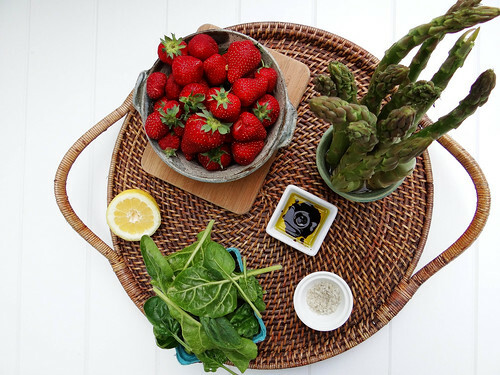 top with quartered & hulled strawberries and asparagus pieces. in a small bowl muddle the strawberries. add remaining ingredients and whisk until well combined. taste and adjust salt/sugar to your liking. 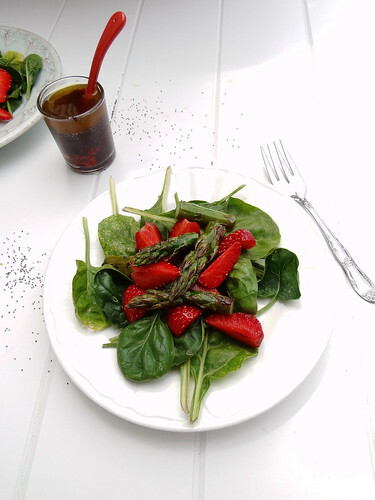 you will want the dressing to be a bit on the acidic side which will compliment the already naturally sweetened salad. You are very fortunate to be close enough to a farm for weekly trips, for freshly picked produce! Your salad looks very tasty. 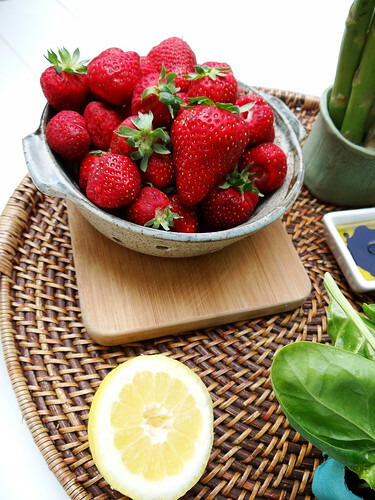 I have had strawberries with spinach, but haven't thought to add asparagus. I will try that the next time! I am absolutely fortunate - the couple that runs the farm are two of the most amazing people I have ever met, they truly love what they do! Also, I nominated you for an award! For once I'm nominating you, not the other way around. ;) Check out my most recent post to find it. Um perfect timing is right! this sounds (and looks) so scrumptious! i love the way the colors just jump off of that white table! beautiful photography! thanks for sharing! I love your spring salad! So good and healthy! oh my strawberry plant in the balcony now has 2 strawberries! 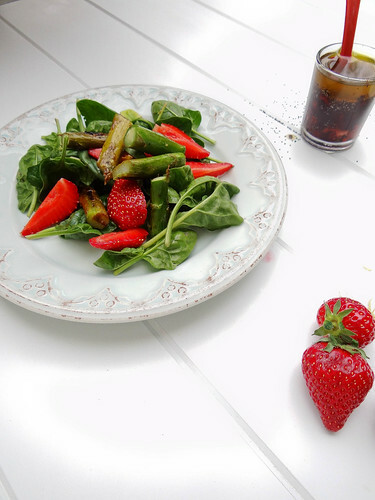 maybe i can make a tiny salad with balcony farm to table(10 steps to kitchen) spinach, strawberry and mint salad:) Theres a lot of mint and spinach filling up the pots. We are incredibly lucky to have so many wonderful farms and farmer markets all within 10-20 minutes from each other! Ooh you're lucky - I haven't seen any local strawberries yet. 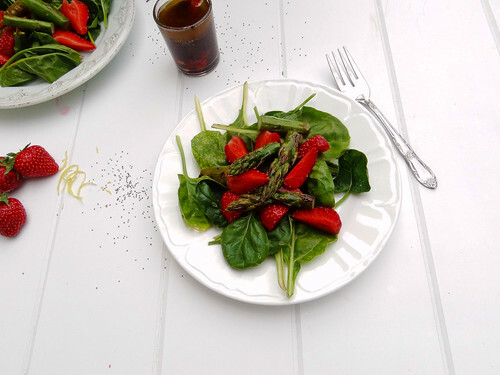 I love using strawberries in salads, although there always seems to be such a limited period when I can use fresh local ones. My mom makes her strawberry salad with candied almonds, and I love your other suggestion of adding avocado too! We have about a 4-6 week window for local strawberries...with the eeception of a grower that grows hydroponic strawberries throughout the summer a few twons over! That's so lovely that you were able to make this salad out of such fresh, local ingredients! I'm jealous to say the least! It is always an exciting time of year for me once the local fruits and veggies start appearing - the taste is just so phenomenal! You are so right Uru, this totally sings spring! Delicious dish and delicious pictures! 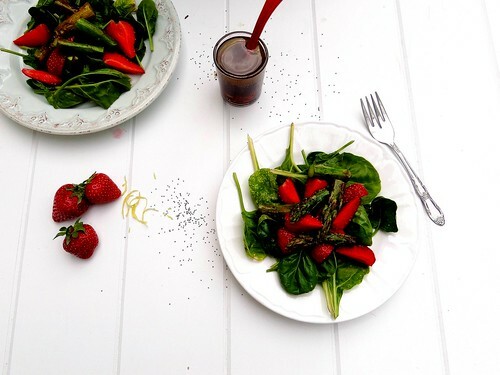 Asparagus, spinach and strawberries... what else? :) I love it. Awww thank you Tuonela - I had so much fun photographing this salad. Everything about spring makes me smile, this salad was pure happiness! wow, i feel so honored that i inspired this GORGEOUS salad!! it looks amazing, girl and i will probably make your version tonight for dinner! You inspire me everyday Miss Lady! The avocado was SO. FREAKIN. AMAZING! I know - the season is way too short, I just picked up the last of the asparagus harvest from my farmer; so I better savor it!